Towards the end of my pregnancy, I wasn't in the mood to eat too often. Not because I was having food aversions, but because I felt like there was NO. MORE. ROOM. in my stomach. Every inch of space felt like it was taken, and food was the last thing I wanted to add to the equation. Since I still needed to feed my growing baby (and my husband), I preferred lighter meals when I had the energy to cook. 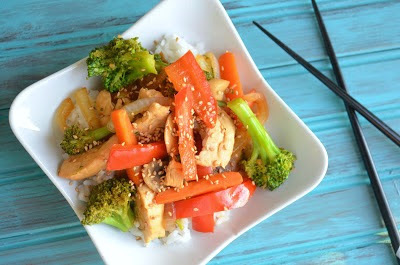 I made this Chicken Teriyaki Stir-Fry, which was packed with vegetables and had amazing flavor. It was light enough for me, but when paired with some rice made a full meal. Enjoy! Mix soy sauce, brown sugar, agave nectar, vinegar, garlic and ginger in a small bowl. Mix water and cornstarch until cornstarch is dissolved and add to soy sauce mixture. Set aside. Fill a medium saucepan halfway with water. Heat water to boiling. Add broccoli and cook for 3 minutes. Drain and set aside. Heat 1 tsp. oil in a large skillet. Add chicken and cook until done, about 7 minutes. Remove chicken and set aside. Add remaining 1 tsp. oil to skillet. Add carrots, red peppers, mushrooms, and onions. Cook until tender, about 5-7 minutes. 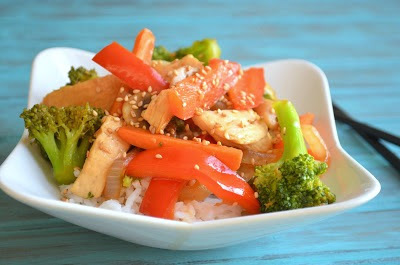 Add broccoli and chicken to skillet with other vegetables. Add soy sauce mixture and cook until well-coated, about 3 minutes. Serve over rice and sprinkle with sesame seeds. 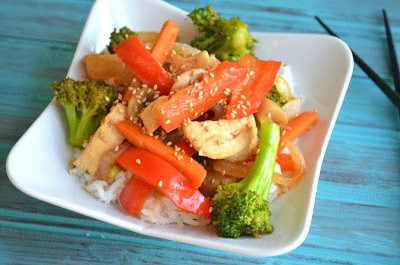 I'm looking for a Recipes For Stir Fry that is good for the health and my family will love. Finally, I found the recipe I'm looking for and I will buy all the ingredients given here. Thank you for sharing this with us.